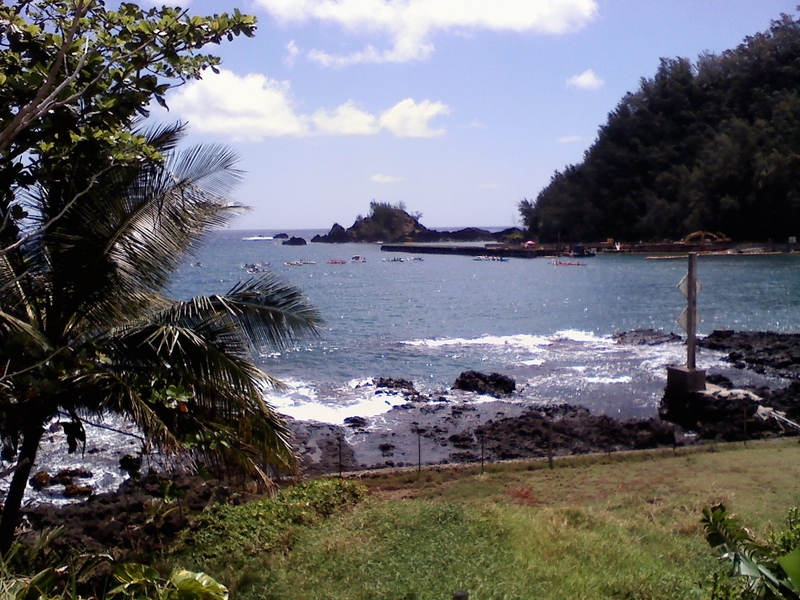 Welcome to Bayhouse Hana, a private getaway on the shore of Hana Bay. We offer a one bedroom suite that sits at the water’s edge. 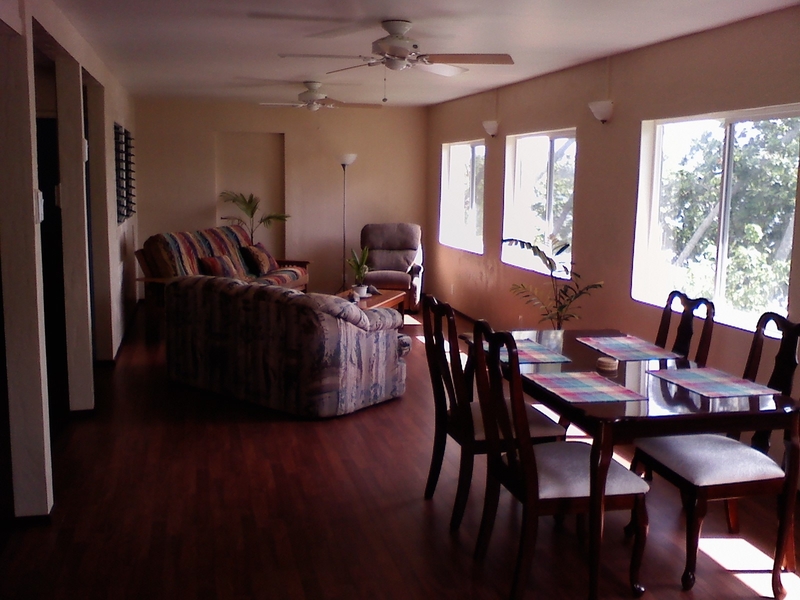 If you love the sounds and smells of the fresh Pacific Ocean, you will be at home here. Bayhouse Hana is away from it all and in the middle of Hana at the same time. 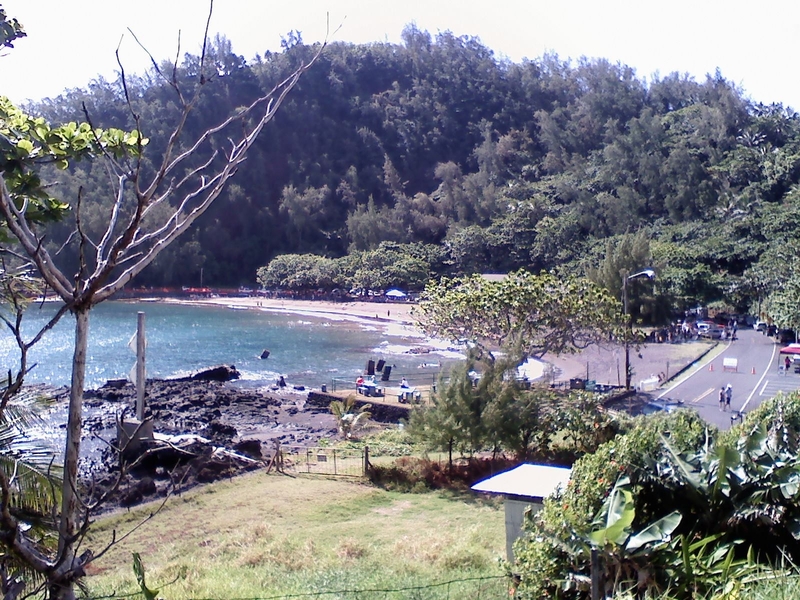 It’s just a few steps to the sandy beach at Hana Bay and the commercial center of town is a short walk. 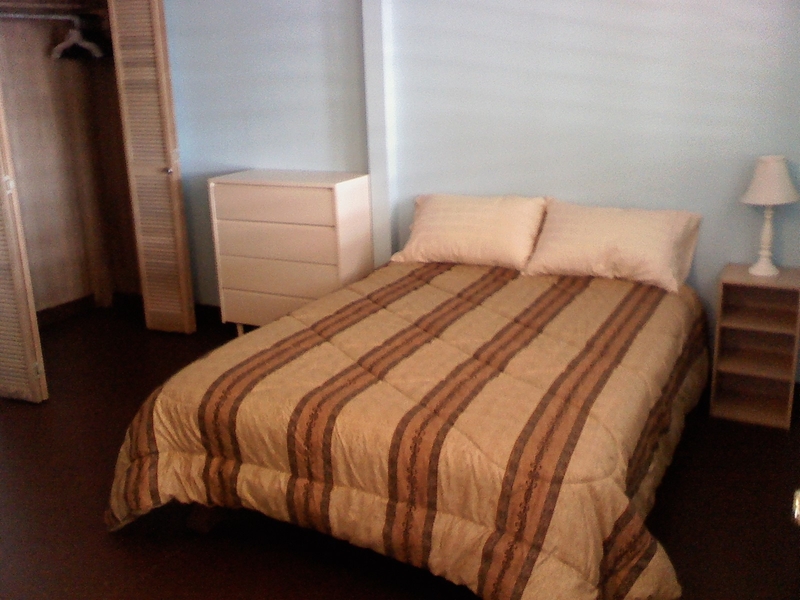 We can accommodate up to four people. However, we do not provide amenities for very young children, i.e., high chairs, cribs, etc.. Our basic rate is $250 plus 13.416% state tax and if you book through VRBO, they add a nominal fee. We require a deposit of 25% to confirm a reservation; the balance comes due thirty days prior to check-in. 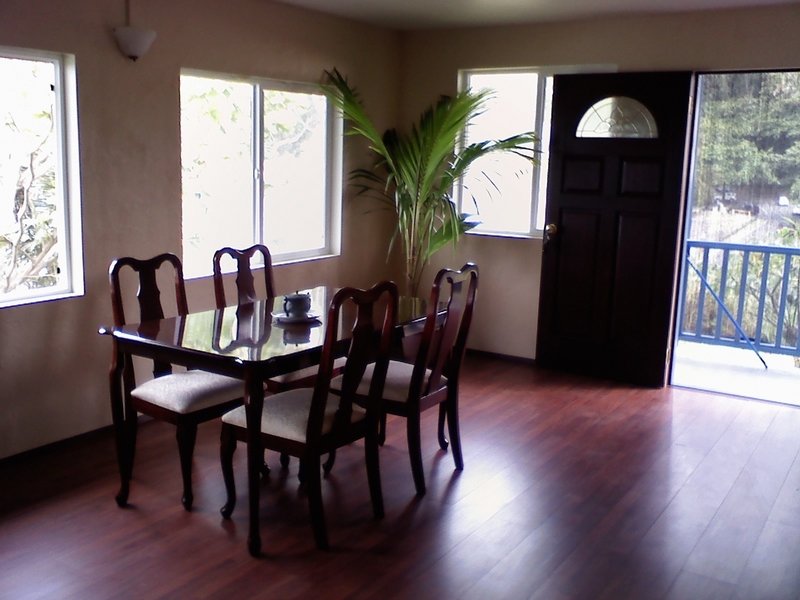 If you would like to make a reservation through VRBO, please go to http://www.vrbo.com/359815. 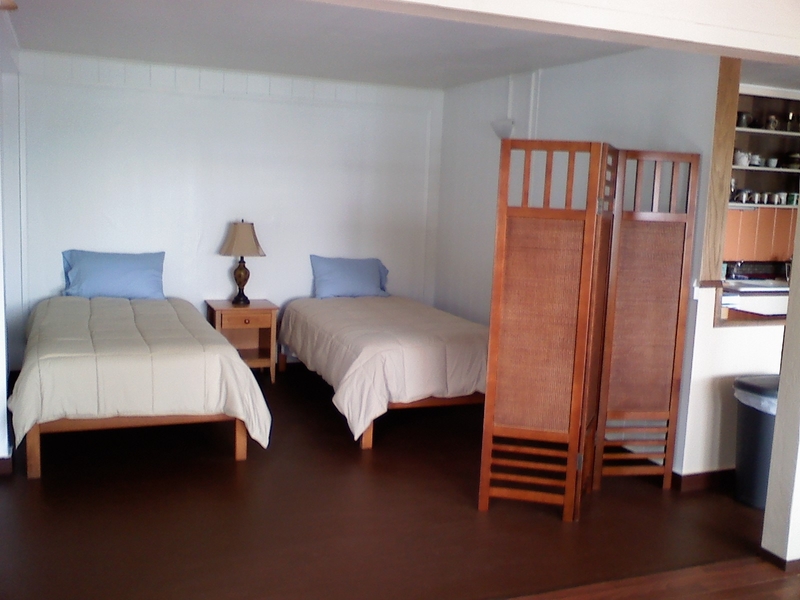 Or you can contact us through our e-mail address: bayhousehana@gmail.com or call 808 269-5414. Our check-in time is 3:00 PM and our check-out time is 11:00 AM. Directions for driving to Bayhouse Hana are given upon receipt of final payment for your stay. Go to rate and payment policy page link above for more details. 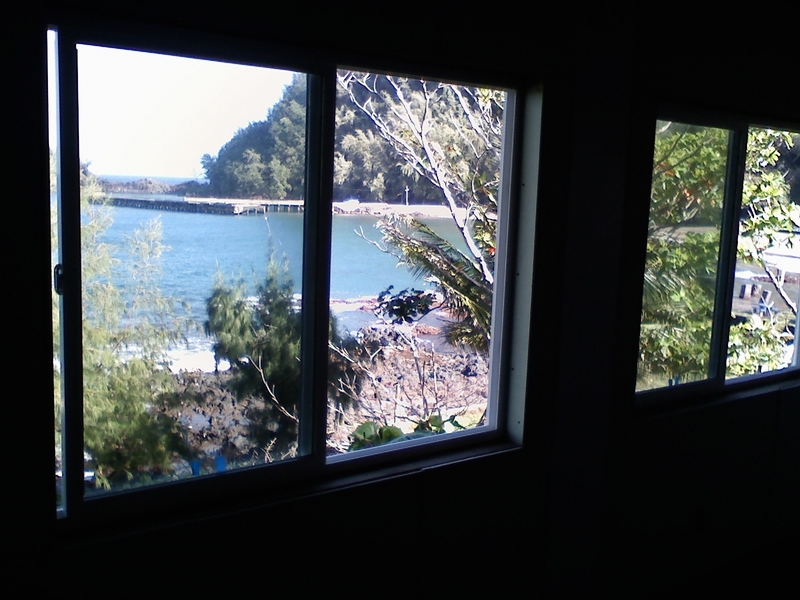 The whole of Hana Bay is visible from the living room and dining area of Bayhouse. Enjoy your meals and the view of the ocean here. 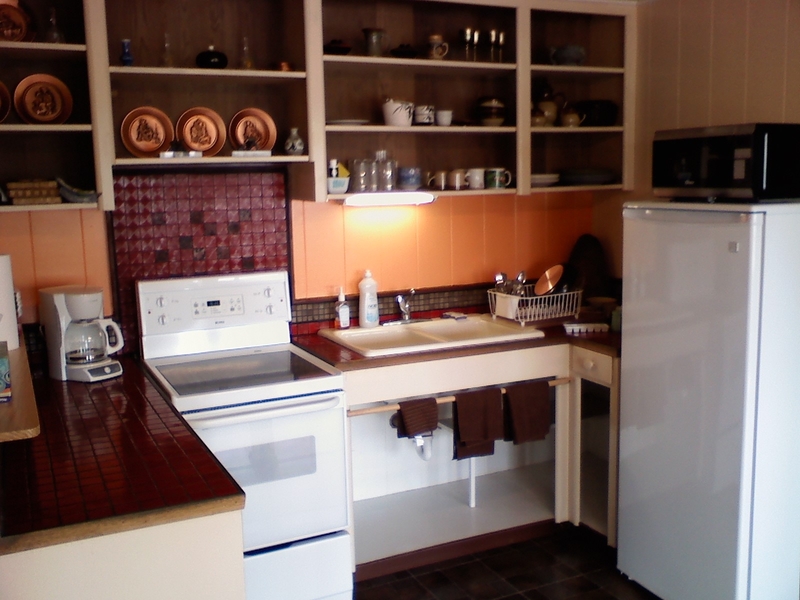 The full service kitchenette opens into the livingroom-dining area and shares the full view of the bay. The bedroom is shielded from the brightness of the day, perfect for that midday snooze if you so choose. The Alcove with two twin beds opens into the living room and dining area. 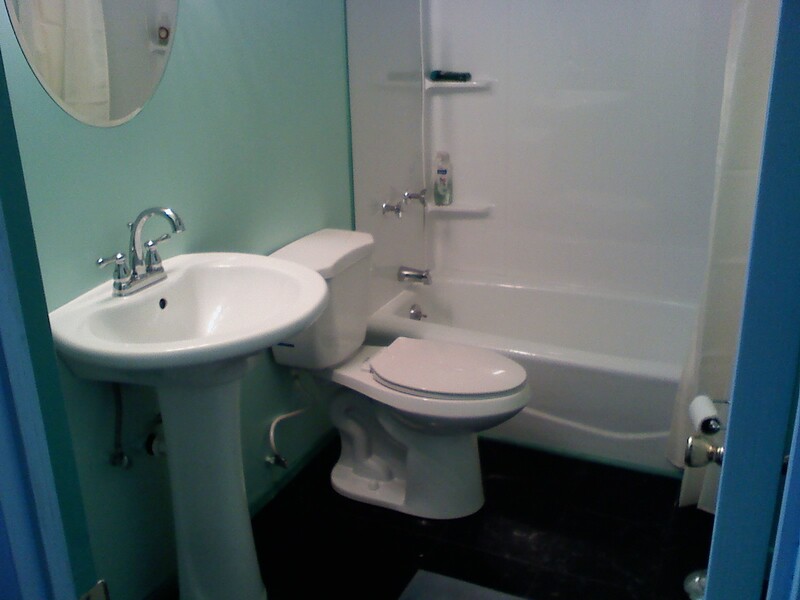 The bath provides a tub-shower for your comfort; it is tucked off the bedroom. 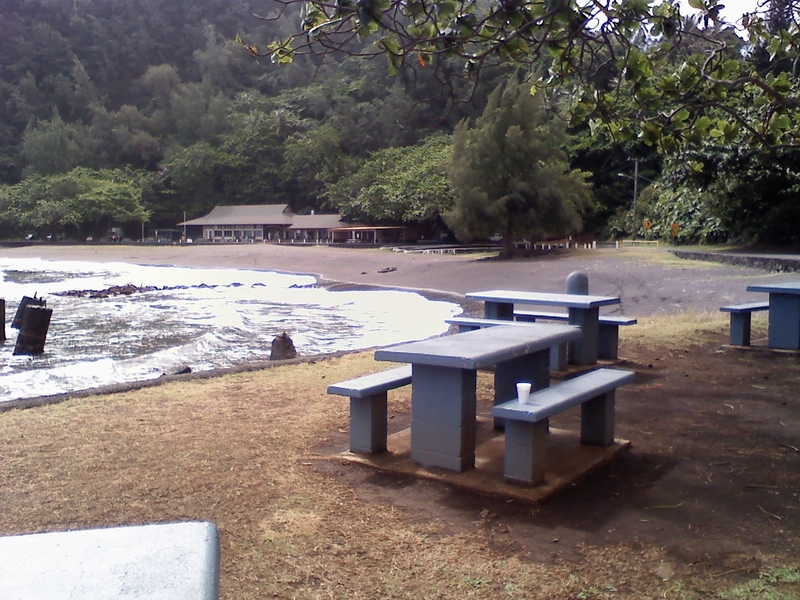 View of the Hana pier and lighthouse from Bayhouse. 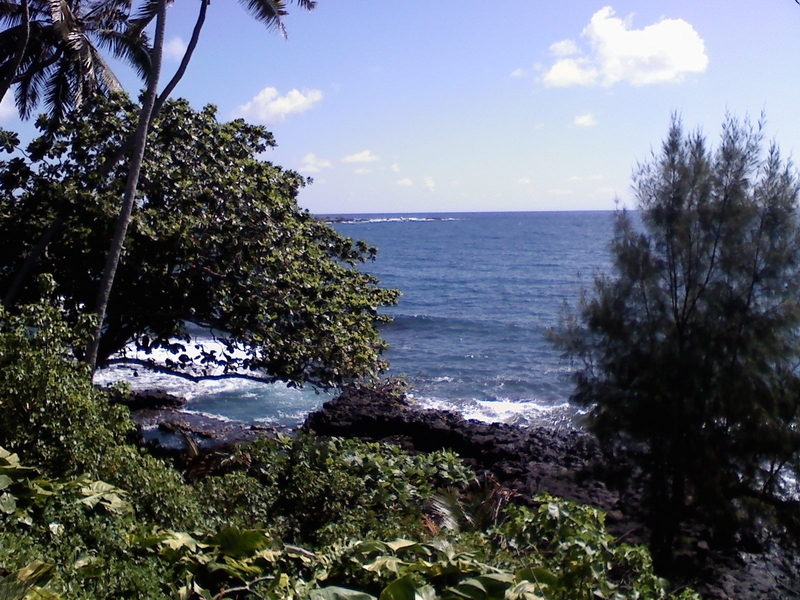 Hana Bay Beach Park and a sandy beach is a minute’s walk from Bayhouse, a perfectly safe swimming spot and ideal snorkeling among coral reefs. A snack shop serving a breakfast and lunch menu is located at the community hall. View of the outer bay from Bayhouse, the tip of Waikoloa peninsula is seen in the background. 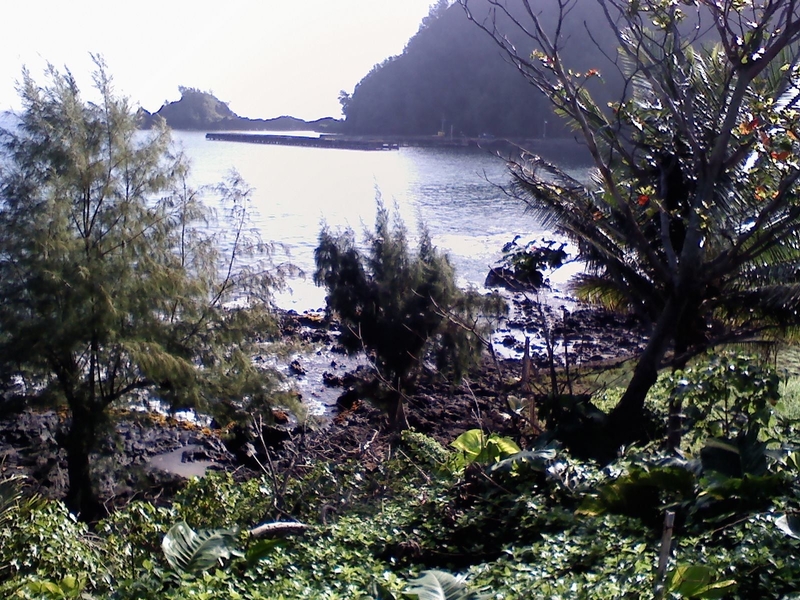 Legendary Ka’uiki Hill stands over the bay. The ground level unit is called Iwa Suite. It has been in operation since April, 2011. The upper level is still being renovated slowly, like molasses flowing uphill, but we have hope that it will soon sport a “super studio” unit filling approximately half the space. The balance of the space upstairs is being dedicated to family use. A shade clothe screen provides a degree of privacy for the entrance landing.